Acknowledged author Patricia A. Potter RN MSN PhD FAAN wrote Fundamentals of Nursing, 9e comprising 1392 pages back in 2016. Textbook and etextbook are published under ISBN 0323327400 and 9780323327404. Since then Fundamentals of Nursing, 9e textbook received total rating of 4 stars and was available to sell back to BooksRun online for the top buyback price of $36.63 or rent at the marketplace. It’s your complete guide to nursing ― from basic concepts to essential skills! 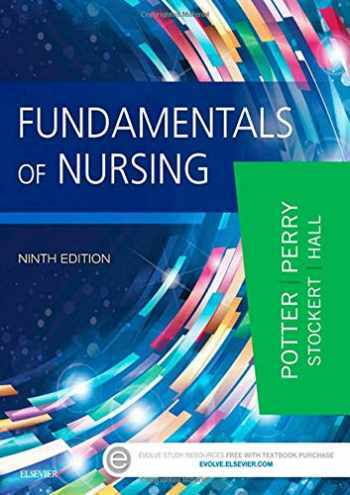 Fundamentals of Nursing, 9th Edition prepares you to succeed as a nurse by providing a solid foundation in critical thinking, evidence-based practice, nursing theory, and safe clinical care in all settings. With illustrated, step-by-step guidelines, this book makes it easy to learn important skills and procedures. Care plans are presented within a nursing process framework, and case studies show how to apply concepts to nursing practice. From an expert author team led by Patricia Potter and Anne Griffin Perry, this bestselling nursing textbook helps you develop the understanding and clinical reasoning you need to provide excellent patient care. 51 skills demonstrations provide illustrated, step-by-step instructions for safe nursing care ― and include rationales for each step. 29 procedural guidelines provide streamlined, step-by-step instructions for performing basic skills.UNIQUE! Critical Thinking Models in each clinical chapter show how to apply the nursing process and critical thinking to achieve successful clinical outcomes.Evidence-Based Practice chapter shows how nursing research helps in determining best practices.UNIQUE! Caring for the Cancer Survivor chapter prepares nurses to care for cancer patients who may still face physical and emotional issues.Case studies include unique clinical application questions and exercises, allowing you to practice using care plans and concept maps.The 5-step nursing process provides a consistent framework for care, and is demonstrated in more than 20 care plans. 15 review questions in every chapter test your retention of key concepts, with answers available in the book and on the Evolve companion website.Practical study tools on Evolve include video clips of skills, skills checklists, printable key points, a fluid & electrolytes tutorial, a concept map creator, an audio glossary, and more.UNIQUE! Clear, streamlined writing style makes complex material more approachable. More than 20 concept maps show care planning for clients with multiple nursing diagnoses. Key points and key terms in each chapter summarize important content for more efficient review and study.Unexpected Outcomes and Related Interventions for each skill alert you to potential problems and appropriate nursing actions. Delegation coverage clarifies which tasks can and cannot be delegated. A glossary provides quick access to definitions for all key terms. UPDATED! Patient Safety and Quality chapter describes how quality and safety apply to the nurse, and includes a new skill on fall prevention in healthcare settings.NEW content addresses the Affordable Care Act, patients’ perspectives on hospital care as measured by HCAHPS surveys, health disparities and vulnerable populations, compassion fatigue, pain assessment, patient education techniques like teach-back, new equipment, Healthy People 2020, and more.NEW! Additional alternate-item review questions include at least four alternate-item questions ― multiple select, sequencing/priority, delegation, hot-spot images, and fill-in-the blank for medications ― for every chapter.Expanded Building Competency boxes help you apply QSEN (Quality & Safety Education for Nurses) competencies to realistic clinical situations.UPDATED! Unique Evidence-Based Practice boxes in every chapter include a PICO question ― the Problem, Intervention, Comparison, and Outcome ― and summarize a research study along with its application to nursing practice. Over 100 NEW photos clarify procedures and familiarize you with the latest clinical equipment.